*This Comic Book will be available for purchase very soon! 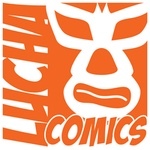 Be sure to follow @LuchaComics for updates on this, and our other titles! An epic, ancient battle, fueled by … the writer’s block of a young man spending too much time on the toilet? Yeah, this is a different story, but one that will have you loving the art, laughing out loud, and questioning some of the challenges we face in everyday life. Stay is a great story if you love underdogs, (or if you’ve ever been one!) that really is about a writer that is too scared of facing true love and ultimately, success. If you’ve had writer’s block, had your heart broken, or are just looking for a fun, unique and entertaining read, this one is for you.